Bubble tea lovers will be happy to hear that a new venue is opening in central Bristol to satisfy their cravings on Sunday, August 12th. Babocha – part of Chinese restaurant Shanghai Nights – will be open from 12pm on the 12th on the ground floor of the restaurant’s home on Nelson Street. Bubble teas – flavoured fruit teas and milk teas – have been one of the most popular drinks in the far east, says the Babocha website, since the 1980s. 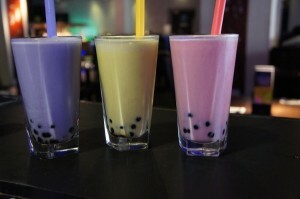 Customers at Babocha will be able to choose from a range of flavoured milk teas (including taro, matcha, chocolate and honeydew varieties) or fruit teas (such as mango, peach and sour green apple) for £3 each, with “textures” in the form of tapioca pobbles or jelly in a range of flavours to add at 50p each. In addition to bubble teas, Babocha will also be serving smoothies, shakes, frozen yoghurt and Yee Kwan handmade ice cream, which comes in exciting flavours such as black sesame, lychee, green tea, and even wasabi! According to Babocha’s Facebook page, they’ll be offering buy one get one free on August 12th when they open, so head over and try them out if you get the chance!